Hello Friends! !, here is the fourth card showcasing the Share What You Love Suite! and as mentioned before these are brand new products from the upcoming catalog that is being released in June!! You can start getting these products in May by purchasing these bundles.. and depending on the bundle you pick, you get FREE items.. I honestly think that the best one to get is the Gotta Have It All Bundle!! as this one includes three items for FREE, but it also has all the products!! I love the Share What You Love designer series paper. 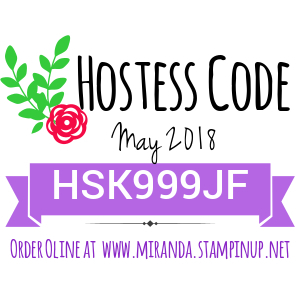 You can see below the three different bundles being offered in May, and when you purchase any of these bundles thru me, using the hostess code shared below, you will get a tutorial to make EIGHT cards with this suite!! I am sure you will love them!! 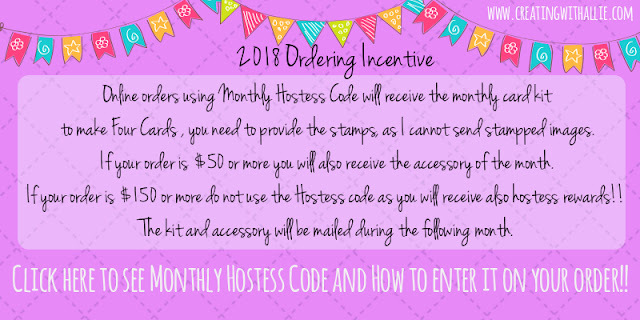 plus don't forget that any of these bundles will qualify to get the ordering incentive, which is the card kit to make Four cards as well the embellishment of the month. The card today is very simple and quick to make.. I love using the embossing folder for the background as it add a really nice dimension to the card.. I also added a twine under the focal point to add texture to the card and though this suite doesn't include the faceted gems, you can see a sneak peek of another product coming up in June, these gems come in mint macaroon, grapefruit grape, blackberry bliss and black, these come in different sizes and thou these gems are not part of this suite, they color coordinate really well with the Share What You Love suite! Card base in Very Vanilla 5 1/2" x 8 1/2", rectangle in Very Vanilla 2 1/2" x 3", card front in Powder Pink 3 3/4" x 5"
Below is the supply list for all the items I use to make this card, there are some items that are not yet available until June, so I cannot add it to the supply list, you can click at any of the images to go to my online store, where you can purchase any of these items!! thanks a lot!! I truly appreciate your support, also don't forget about my ordering incentive this year! !